GestureFX is a stunning interactive visual display system for show-stopping interactive advertising and entertainment in public spaces. It's one of the world’s most advanced gesture recognition solutions for motion-control interactive displays, signs and surfaces. GestureTek’s patented body tracking technology responds to body movement to project dynamic interactive multimedia content, special effects, interactive advertising or games onto any surface, of any size. 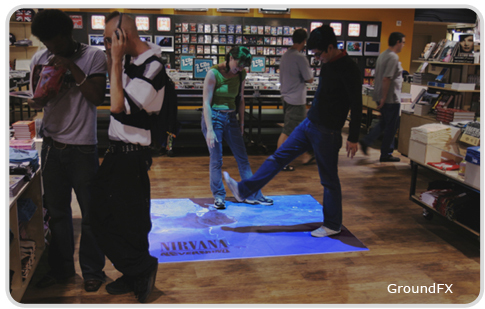 Transform your floors, walls or any surface into dynamic multimedia interactive visual displays! Engage patrons with an interactive floor, interactive table, interactive wall, interactive bar, interactive counter, interactive screen or interactive window and watch your business grow. GestureFX creates memorable interactive experiences in retail stores, hotels, restaurants, casinos, trade shows, museums, science centers, sports arenas or any public space. Anything is possible, from an interactive floor projection, to an interactive wall map to interactive video games with the spectacular interactive special effects technologies of GestureFX. More than 70 eye-catching pre-programmed applications come included with GestureFX, or can be customized to meet any requirements. GroundFX® is protected under patent TMA 698,677 issued by the Canadian Intellectual Property Ofice for "computer-based camera system used to track images".